Had the great pleasure of attending the wedding of one of my husbands work colleagues yesterday. It was a truly amazing day in terms of venue, decor and food! The ceremony and reception were both held at Coos Cathedral Aboyne which is a real hidden treasure of Royal Deeside. I instantly declared that this is where I will host MY next wedding! Husband didn't seem that perturbed by this suggestion as I have said similar about The Treehouse at Alnwick Garden. On arrival we were served welcome drinks of Elderflower Cordial and Sparkling Mineral Water - clearly non alcoholic to avoid any premature rowdiness! After a moving ceremony we threw confetti and toasted the happy couple with Champagne and then moved outside for Canapés and Pimms on the lawn. 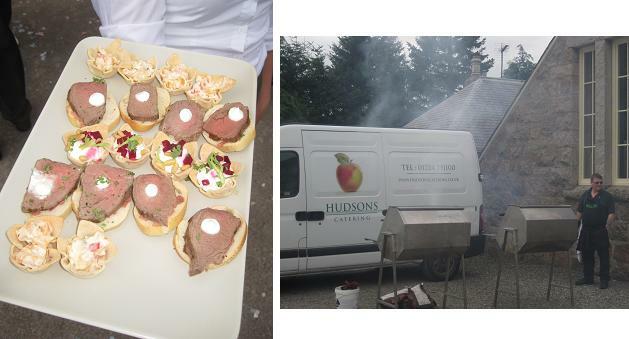 Catering for the day was provided by Hudsons and they did a superb job both with the quality of the food and the friendly and attentiveness of their staff. There were a lovely selection of canapés on offer including haggis balls with whisky dip, grilled chilli prawns, beef on toasted croutes and marscapone cheese & beetroot and mixed pepper croustades. I also caught a glimpse of some quiche and pastry like ones but alas they never seemed to head in our direction! On arrival at the venue one of the first things I noticed were two large Barbeques which were there to cook the Wedding Breakfast. My first ever BBQ wedding and I was excited about what was to come before I even glimpsed the tantalising menu. There was a slight moment of concern when we started to smell smoke and lighter fuel during the ceremony - especially for those who hadn't spotted the BBQ's! 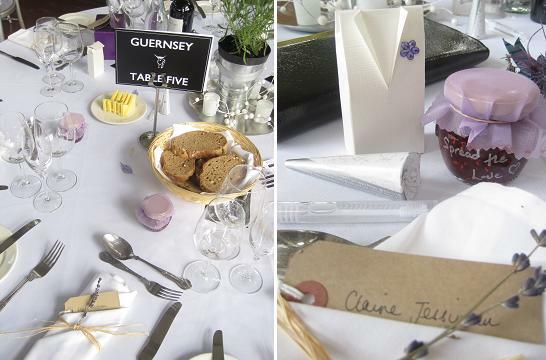 The table settings included homemade foodie favours lovingly made by members of the happy couples family. Tablet for the gents and a pot of raspberry jam for the ladies with a message inviting you to "Spread The Love". In keeping with the Coo theme all the tables were named after breeds of cows from the Top Table Highland Coo the the risqué Stud Farm! Following the customary speeches it was time to tuck in. The BBQ was served buffet style and you could have as much as you wanted - and seconds! I went for the rib eye steak, lamb, venison sausage and seafood kebab. All were delicious but the steak and kebab were my favourites. The range of side dishes, relishes and accompaniments were amazing and as you can see I generously filled my plate! I has assumed that desert would be one of the four choices on the menu but buffet style you could have all four! So it seemed rude not to... I am a huge lemon tart fan but unfortunately this was the only part of the meal that I didn't enjoy. The pastry was undercooked and soggy and the filling insipid and lacking in any zestyness. The Creme Brulee was gorgeous with a hidden raspberry in its depths and despite not being a chocaholic I really enjoyed the brownie. A quick word on the venue decor which was undertaken by the bride and her friends and family. There were lovely touches everywhere from copious pom poms and bunting to homegrown lavendar and beautiful floral decor whith hydrangeas featuring prominently. Paper lanterns, fairy lights and Candle Bags magically lit up the venue at nightfall. I have stored lots of the ideas in away as I have a significant birthday coming up later on this year for which I am on the lookout for inspiration! The evening buffet consisted of the now apparently traditional Stovies, Beetroot and Oatcakes. There was also a vegetarian version on offer which looked from it colour like an intreaguing mix of carrots, neeps and tatties. Alas I was still too full from earlier to try any but as lover of all things cheesy - the smellier the better - I did manage to make space for a selection from the cheeseboard including including Goats, Brie and Blue. No room for wedding cake either but I did sneak a couple of slices home for boy and girl. Lots of tasty memories from a fantastic day. Wishing all happiness to Rachel and Stuart.